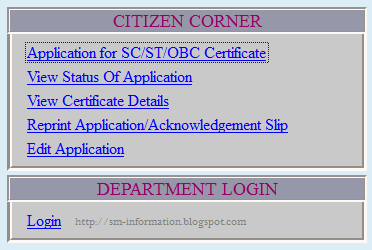 Step 2: On that webpage click on "View Status Of Application" under "CITIZEN CORNER" Section. Step 3: After that you will get a page "View Status Of Application" and type your "Application No. :"
Step 4: After that click on "Search" button. Step 5: After that you will get your "Status of the Application". you will see status is something like "Application submitted hard copy not received". 0 Comments For " How To View Status Of SC/ST/OBC Caste Application [West Bengal] "